Join the Mulligans Friends for their Autumn bird walk on Sunday May 10. Local birders will lead our walk through the Sanctuary, which provides habitat for over 150 bird species. 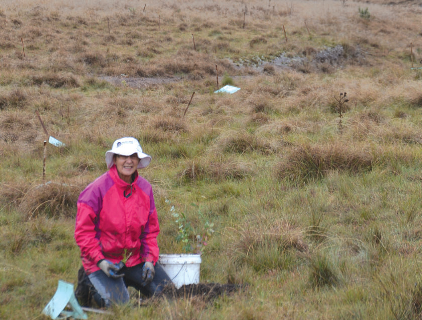 About 40 volunteers planted 1000 trees and shrubs at Bush Heritage Australia’s Scottsdale Reserve, north of Bredbo, on Sunday June 1, in the next stage of a six-year 300-hectare ‘Whole of Paddock Rehabilitation’project with Greening Australia. of acacias and other mid-storey shrubs. The work will add to 100 hectares already restored in a bid to promote connectivity and enable birds and other animals to move around the landscape. Please take a look at the recent article in the Monaro Post. The LL4SBB Project has received an enormous response, with over 80 people submitting an Expression of Interest. The selection process was difficult as many of the properties were ideal for our project. We have however, made a decision based on a series of additional criteria. The properties chosen allow the best outcomes for small bush birds in our region. In the end it came down to simple ‘communication’. Neighbours chatting with neighbours and deciding to submit combined applications. In one instance, a property that alone did not meet the criteria (was too distant from remnant woodland), when joined to neighbouring properties, became suitable. This property will now connect to remnant woodland across several neighbour’s land. This has allowed for a greater impact on the ground, with over a kilometre of linear, connective habitat opened up for small bush birds. Remnants of two threatened ecological communities in Taylor’s Creek - Grassy Box Gum Woodland and Snow Gum Woodland will now be connected by a series of ‘stepping stone’ exclosures, for small bush birds. Due to the popularity of the project, and large number of suitable sites remaining on file, we anticipate and eagerly look forward to applying for future funding along the same theme. QuestaBird is an outdoor adventure game where players compete by photographing birds in the wild. Join quests, earn gold, buy supplies, gain levels, build your collection - and help document and protect Australia's biodiversity! Try it. It's free. Come and join us plant 500 Drooping Sheoak seedlings as part of the Glossy Black-Cockatoo Project followed by a complimentary BBQ/Outdoor Roast lunch.